Home Board / Organizations TSCHE TS ICET Application Form 2019 – Released! 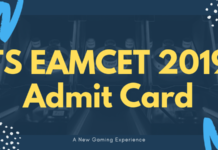 TS ICET Application Form 2019 – Released! TS ICET Application Form 2019: Kakatiya University, Warangal has released the application form for TS ICET 2019. The candidates who wish to take admission for MBA and MCA program in the academic session 2019 can apply online for the same. In the online application form, the applicants have to enter their Personal Details, Educational Qualification, and other necessary information. Also, applicants need to upload images as per the specification. Those who will successfully register for the exam will be issued hall ticket and can appear for TS ICET 2019 exam. 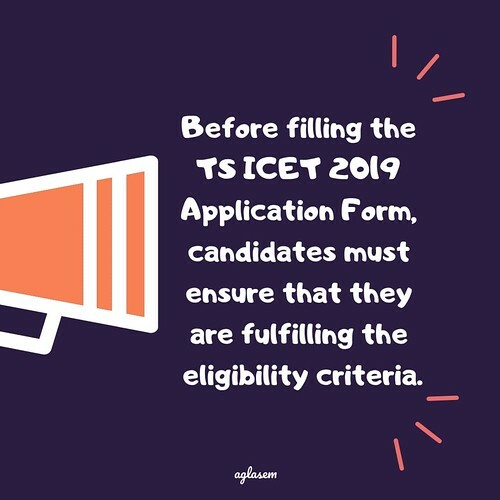 Check more information regarding the TS ICET 2019 Application Form in the page below. Latest: The TS ICET Application Form 2019 has released. Scroll down to fill the same. Online applications have been invited for the appearance at the Telangana State Integrated Common Entrance Test for admission into 1st year MBA/MCA Degree Course for the academic year 2019-2020. Applications should be submitted through online mode only. Before applying for TS ICET candidates must check the eligibility criteria carefully. TS ICET Application Form 2019 schedule is given below. Apply Online: Click Here to apply online for TS ICET 2019. The Registration fee for online submission and late fee required to be paid at APOnline /TSOnline Centers and also through payment gateway (Credit Card/Debit Card/ Net Banking). 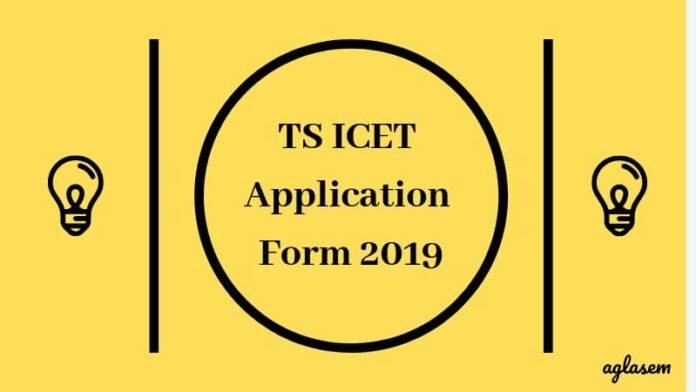 How to fill the TS ICET 2019 Application Form? Click on the “Application Fee Payment” to fill the required application fee. Fill the asked details in order to make the payment and proceed. The Candidate can use any Bank Card (Debit / Credit/Net Banking) provided it is either VISA or MASTERCARD or MAESTRO type. The confirmation of successful payment of Registration Fee is shown with the “Transaction is successful”. After completion of Fee Payment, Candidate can check the Status of the Payment by Click on Payment Status tab. Enter Qualifying Examination Hall Ticket Number, Mobile Number then click on Check Payment Status button to check the status of the payment. Click on the link which will be given on this page to apply online for TS ICET 2019. Personal Details: In this section, the applicants need to provide details such as their Name, Father’s Name, Date of Birth, Category (SC, ST, BC, etc. ), Local Status (OU/AU/SVU/ Non-local), Minority, Income of Parents, etc. Also, the applicants shall have to provide their Aadhar Card Details while filling the application form. Educational Qualification Details: For this, the candidate needs to provide the information about their academic background, such as Hall Ticket No. of SSC or Equivalent (Class 10th), Marks Obtained, Name of the Board, name of the School, Passing Year, etc. Communication Details: Address for Correspondence, State, District, City, Pincode, etc. Modify: Candidates can also edit the application form if they any wrong information in the online application mistakenly. For this, Click on the Modify button to modify the application. Before the final submission, ensure that the details given are correct and the images are uploaded as per the specifications. If satisfied, submit the TS ICET Application Form online. Also, it is advised to applicants that after submitting the application form to take a print out of the completed application for future reference. Candidates can avail the facility to access the application correction window to make certain changes in the form after its submission. While editing the form, candidates cannot change the exam center preferences as a matter of concern. The dates for making the certain correction will be released on the official website of TS ICET. Once the corrections are done and submitted, candidates cannot change them afterward. Any change whatsoever including that of Caste/Community/Status of category and regional center claimed in the Online application form will not be permitted once the form is registered with the Convener. Q. If I do not appear for TS ICET 2019, can I get a refund on the application fee? A. The application fee paid by the candidate is non-refundable. So, it is advised to apply for TS ICET 2019 and fill in details on the application form carefully. Q. 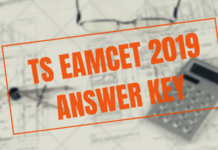 Can I obtain the TS ICET 2019 Application form at the Help Line Centers? A. If last year trends are looked into, it is expected that the candidates need to fill and submit the application form by online mode only. Q. Can I provide my parent’s or one of my friend’s Email ID or Mobile Number? A. Though there is such compulsion to not to provide anyone else’s Email ID and Mobile Number. However, it is suggested to provide personal Email ID and Contact Number so as any information regarding the exam will be sent through electronic means and will reach to you in time. Q. What if I don’t have a Mobile number? A. In case if the candidate doesn’t have a Mobile number enter the mobile number of your Parents / Guardian. Q. I have submitted the TS ICET 2019 Application Form but I have to edit some information now. How can I make corrections on the application form? A. After the final submission of the application form, the applicants shall not be allowed to make any corrections. However, the candidates shall be able to edit some of the fields (excluding Regional Test Centre) in the Filled In Online Application Form by writing a request letter with relevant proofs.